Making your own pizza dough at home is a fun project and also a great way to help elevate your pizza game. With a bit of experimentation and a few recipe revisions, home-made dough can taste and perform better than anything you’ll find at the grocery store. But making dough at home can also be a bit messy and, let’s face it, a bit inconvenient. Making your own dough from scratch every time you want pizza at home is something most of us don’t have the time or energy for, so today we’re going to show you how to freeze your dough. Why Freeze Your Pizza Dough? Successfully freezing your pizza dough allows you to stock up so that you always have a piece on hand when the pizza cravings hit. Once you’ve got your stash, you’ll be ready for pizza anytime, without any mixing or mess-making. I used to think frozen pizza dough was inferior, or that it was akin to cheating in terms of quality – but the truth is quite the opposite. When I decided to write this blog I had my suspicions, but after some thorough testing I found out freezing pizza dough doesn’t make it any less delicious. 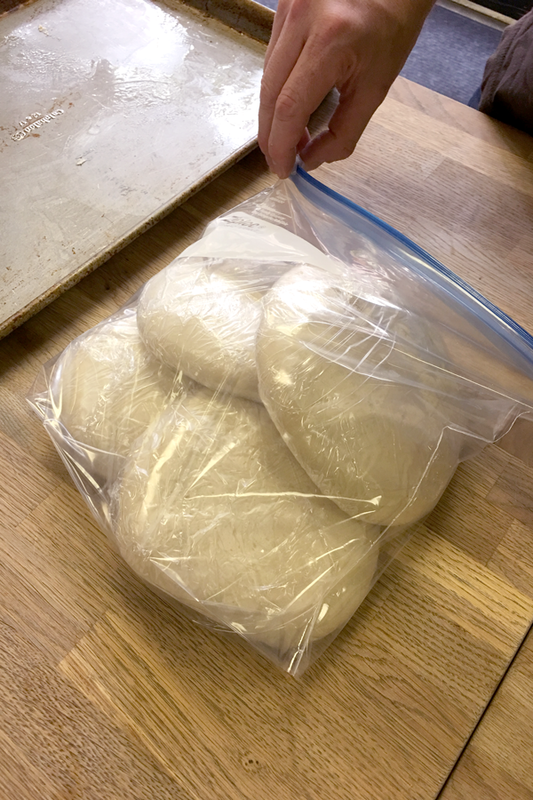 To get started freezing your own dough, I’ve got a basic pizza dough recipe that’s featured on our pizza dough rolling mat. This recipe is relatively simple and easy to make and I’ve already tested it in the freezer. Let’s take a look at what it involves. In the bowl of a stand mixer, add yeast to lukewarm water and mix to dissolve. Add oil and sugar to bowl, then add 4 cups bread flour. Add salt and begin mixing on low speed for 2-3 minutes until flour and water are combined. Allow dough to rest 10 minutes so that the flour can absorb the water. Continue mixing on medium speed another 5-7 minutes, adding remaining 3/4 cup flour slowly until smooth, shiny texture is achieved. You may or may not need the entire 3/4 cup flour to finish the dough. Divide dough into four 9-ounce pieces and place on a baking sheet. Refrigerate covered overnight. First, transfer the dough from the refrigerator to the freezer. Let the dough sit for 40-60 minutes uncovered, so that it may firm up enough to be removed from the tray. Once you’ve got the dough off of the tray, wrap each ball in plastic wrap and place them in a large Ziploc bag or container. Write the date you made the dough and store it in the freezer for later use. The frozen dough will last a few months, possibly even longer. 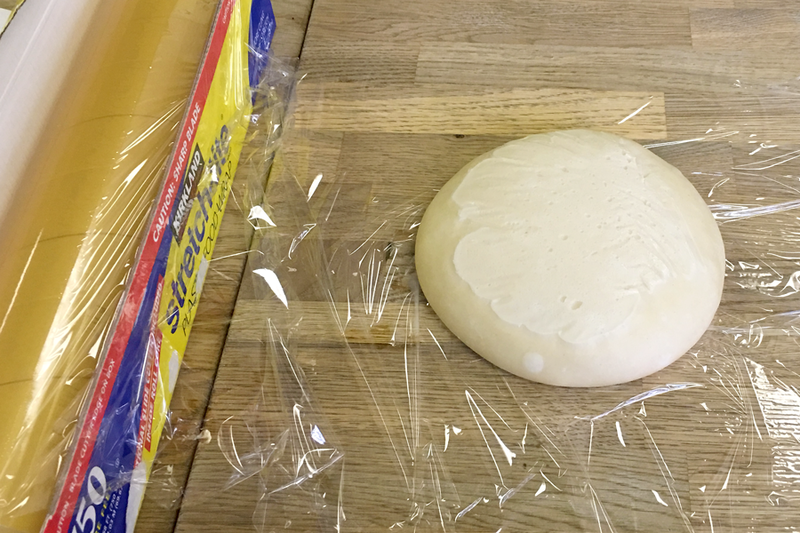 When you’re ready to use a piece of dough, take it out of the freezer and unwrap it, reuse the plastic wrap to cover it on a plate or cookie sheet, and allow to defrost for 6 to 8 hours (or overnight). Once the dough is fully defrosted, it should take 1-2 hours to proof at room temperature. With this technique you can easily stockpile your own dough in the freezer for your next pizza party. You'll get the pride (and taste!) of delicious homemade pizza dough, while making it look oh so easy! A sticky dough is not a bad thing, it’ll give you a softer inner crust, I always try to keep my dough more on the wet side than dry, there’s a happy medium, one where it’s sticky but not to the point it stays behind on the counter, having said all this I suggest all lightly powder the dough with four before storing or with olive oil. Dough is very forgiving, salt it to your taste but don’t exceed a tablespoon per 400 grams, Sugar isn’t necessary but helps the rising process, olive oil in the dough gives it a nice flavor, then you can add other ingredients to experiment with, rosemary can add an interesting flavor, substituting some white flour for whole wheat (even just a 1/4 cup) will give it a nice taste, adding a beat egg to the dough is also an option. These are just a few ideas, enjoy! i weight carefully all my ingredients but when kneading the dough is super sticky, can’t even touch it without it tearing and getting it all over my fingers. it glues all over the stand mixer bowl so theres no real kneading. what’s the texture were looking for? I personally add almost 1-/2 cup of flour until it only sticks a little to the bottom of the bowl while the mixer kneads it, is it what were looking for?or do we want the dough to move freely while kneading, without sticking at all in the mixer bowl? thats a big difference of flour from the recipe and i wondered if i did something wrong. -i use instant yeast instead of active dry yeast, maybe thats the problem? - does this dough need to pass the windowpane test? To answer your question, you can defrost the dough either way. If you’re in a hurry, I’d say defrost it at room temperature. If you’re defrosting it for the next day, go ahead and defrost it in the refrigerator. If you do decide to defrost at room temperature, but you won’t be using it right away, be sure to continually check the dough. As soon as it has defrosted you will want to immediately refrigerate it (if you don’t plan on using it right then). Otherwise, the dough will start proofing. 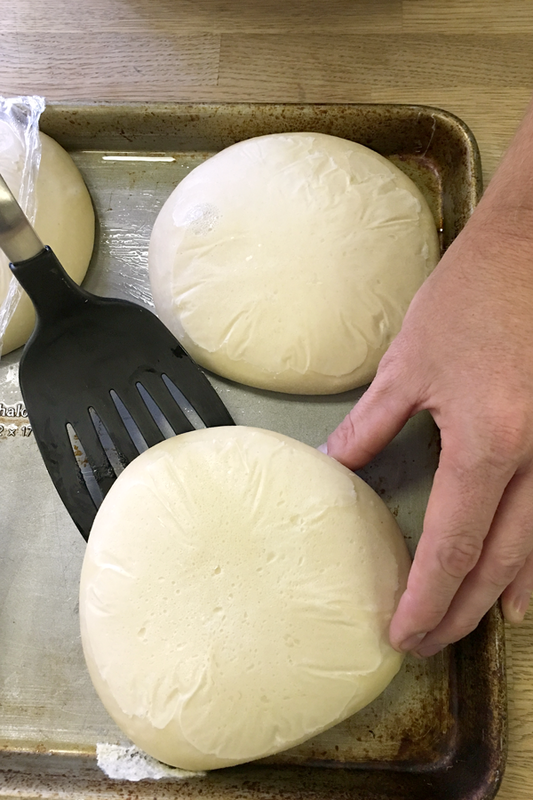 Check out our blog on proofing pizza dough if you need more information on that process. I was wondering if you allow the dough to defrost on the counter at room temp. or do you leave it in the refrigerator?